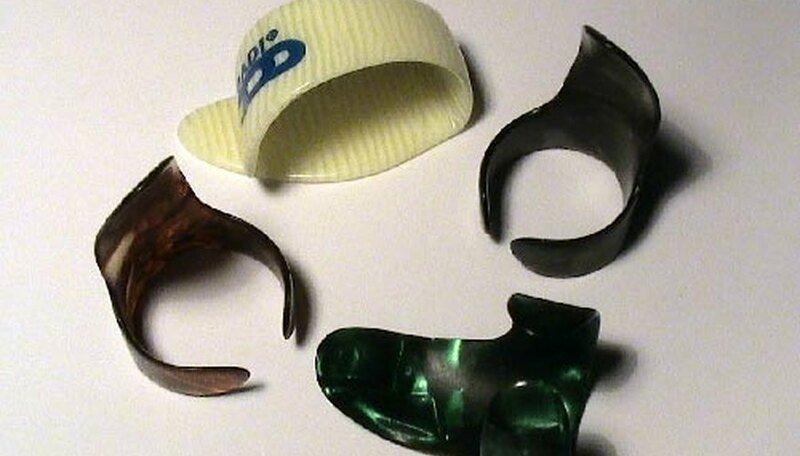 Finger picks are one of several types of guitar picks to choose from. They are used to pluck individual strings with your right hand (if you are right-handed) and are made of plastic, brass or bronze. Finger picking is one of the more challenging skills in playing the guitar. It takes practice and repetition to master the skill. 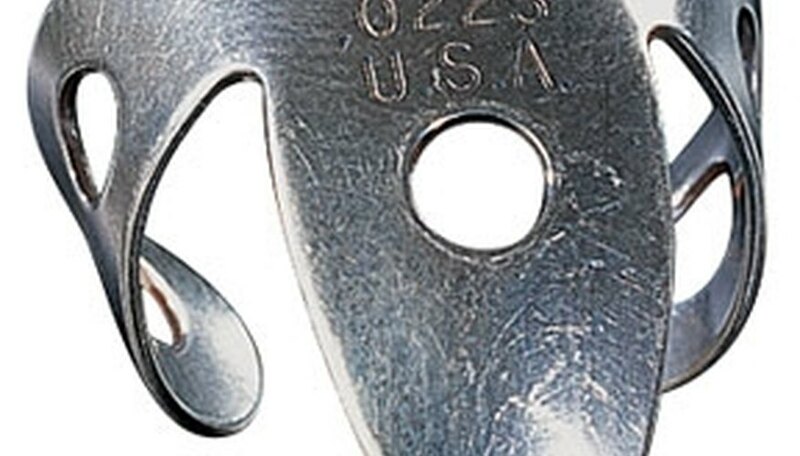 But before you can be an expert, it is important to know exactly how to use finger picks. Put the thumb pick on your right thumb. Wrap it around your thumb and use the part that is sticking out to pluck the guitar strings. 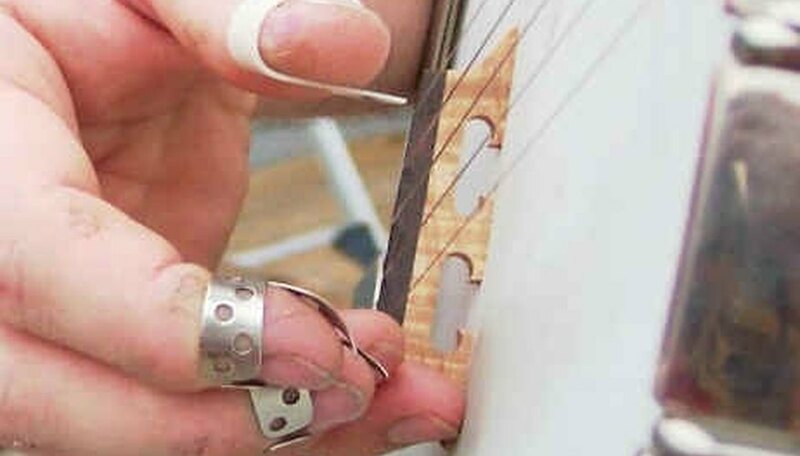 A thumb pick projects the sound of the string better than just simply plucking with the side of your thumb. Put one of the two finger picks on your right index finger. The part of the pick that sticks out and curves is the part used to pluck the strings. Put the second of the two finger picks on your right middle finger. The same part of the pick is used to pluck the string. Pick up the guitar and get ready to start picking. Starting with your thumb, begin slowly plucking the strings, alternating on any three strings, in this order: thumb-middle-thumb-index. Keep doing this until you feel comfortable. Don't worry about forming a chord with your left hand just yet. As you get more comfortable plucking these three strings, begin plucking faster. Do so until you feel comfortable plucking thumb-middle-thumb-index rapidly without messing up. Form a chord with your left hand and pluck the thumb-middle-thumb-index order on the chord. Only pluck the strings relevant to the chord. For example, if it is a C chord, only pluck the strings that are part of the C chord (the A string, D string and B string). Once you are comfortable finger picking on one chord, begin to change chords while maintaining the rhythm of the picking. It will be difficult to do this at first, but with practice, it will get easier.